Winner pilot receive an award from www.condorworld.eu - licence code for Condor scenery Austria 2.0 PRO, second and third place pilots will receive 3D Objects - Gold Edition (for AU 2.0 PRO and CS 3.0 PRO sceneries). Thanks goes to all pilots for joining us in the sky over Austria mountains and also thanks to Radek Miča (RUM) for tasksetting. Big thanks goes to Miloš Koch (MK) and his www.condorworld.eu for preparing for us great sceneries and hosting Condor servers. Welcome our website of next virtual soaring competition - 2nd edition of Retro Cup - fight between great old club planes - ASW19 vs. JantarStd3 - in "retro" style without PDA and water ballast allowed. St. Georgen Am Ybbsfelde in Austria is our start/finish airport for this competition. 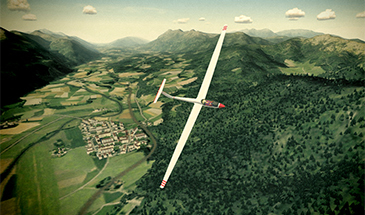 We will fly over brand new scenery - Austria 2.0 by www.condorworld.eu. Tasks with lenght more than 200 km, PDA will be not allowed - NoPDA tasks, don't forget to prepare the map! Overall results is simple count of all 7 tasks. • Scenery: brand new beautiful Austria 2.0, author: Miloš "Cadfael" Koch. Big thanks goes to www.condorworld.eu for hosting Condor servers for our contests and preparing amazing sceneries for us. Thank you again, Miloš! This competition is continued line of successful competitions like Raven Competition, Medlánky Condorworld Cup, Hahnweide Pokal, Fatra Gliding Cup, Xmas Cup, Fatra Gliding Cup, Liptov Shepherd GP, Praděd GP Gliding, Raven Competition, Kiwi Race, OCC and many others.